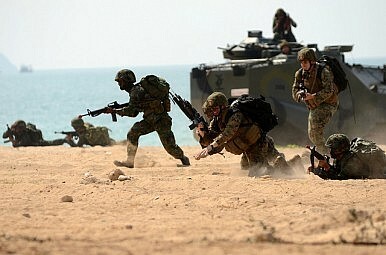 Troops in an amphibious assault raid during Exercise Cobra Gold 2011. The U.S. military will scale down the annual exercise over human rights concerns, but won’t cancel it. On June 12, media outlets reported that the United States had decided this week to go ahead with preparations for Cobra Gold 2016 — the Asia-Pacific’s largest annual multinational military exercise — despite lingering rights concerns. According to the Associated Press, senior State Department official Scot Marciel told a congressional hearing on June 11 that the Obama administration would move forward with Cobra Gold 2016 but that the exercise would be scaled down again because of the political situation in Thailand, where a military junta continues to rule after seizing power in a coup last May. The report publicly confirms what many had already expected. The decision is essentially the same as the one Washington made last October when it chose to go ahead with a scaled down version of Cobra Gold 2015. As I have written previously, this course allows the administration to signal its disapproval with the rights situation in post-coup Thailand while preserving an engagement that is a crucial part of not only the U.S.-Thai relationship, but U.S.-Asia policy as well (See: “US-Thailand Relations and Cobra Gold 2015”). Though Cobra Gold began as a bilateral drill between the United States and Thailand, it has grown to involve some 30 countries including Japan and China. The administration appears to have made the call this year far earlier than it did in 2014. That will be a point not lost on those involved in planning the exercises, which takes longer than most appreciate. Last year, the administration deliberated for so long that some worried it may have been too late to even hold the exercise in February as scheduled even if a decision was eventually made to proceed. Indecisiveness was already beginning to affect the necessary planning that would go into Cobra Gold 2016 this year. In April, the U.S. embassy in Bangkok confirmed that the Concept Development Working Group, the committee which plans the exercises, had delayed its initial planning meeting scheduled to take place from March 24-26 in Hawaii. At the time, embassy spokeswoman Melissa Sweeney had to clarify that while the meeting was delayed, no decision had been made about whether to hold the exercise or not. On the Thai side, officials were waiting for Washington to make up its mind but expecting preparations – including a summer meeting in Thailand – to be held as usual. Now that a decision has been made, such balancing acts will no longer be necessary. Important details, however, still remain undisclosed. Those familiar with the planning of such exercises know that ‘scaling down’ has to be translated into specifics – whether it is the number of U.S. troops participating or what the various components of the exercise will involve. For instance, last year’s ‘scaled down’ Cobra Gold meant that the number of U.S. troops was reduced to just 3,600 and a large-scale, live-fire exercise associated with amphibious landing was canceled. It is unclear whether the scaling down will play out in the same way and occur to the same degree for Cobra Gold 2016. Thailand’s reaction to this will also be interesting to watch. As I noted in a previous piece, the ruling junta struggled with how to explain the ‘scaling down’ last year since it got to the heart of the legitimacy of its rule. Of course, much of this will be determined depending on the state of U.S.-Thai relations more generally. The run-up to last year’s Cobra Gold was especially messy because ties had deteriorated during the weeks leading up to it, with top U.S. envoy for East Asia Daniel Russel’s public rebuke of the ruling junta in a January 26 speech provoking a fierce backlash. Since then, both sides have tried to improve the relationship. Thailand charged its newly appointed ambassador Pisan Manawapat in February with quickly mending ties in Washington, while the Obama administration nominated a new U.S. ambassador to Thailand in April following a six month vacancy for the post (See: “US Nominates New Envoy to Thailand Amid Strained Ties”). But ties will also be a function of how the situation evolves in Thailand. As it is, things aren’t looking all that good. Elections, which were supposed to be held late last year, have now been postponed again till at least September 2016 (See: “When Will Thailand Hold Its Election?”). Martial law has been lifted, but many of the security provisions included in the interim constitution contain similar restrictions on civil liberties. The environment in Thailand is far from one that would allow for the “inclusive political process” that U.S. officials continue to call for. And yet, things could also get much worse in the coming months, with discontent among rival political factions once again spilling into the streets and further setbacks to democracy. In a prepared joint statement for the congressional hearing, Marciel and his two U.S. government colleagues expressed hope that Thailand would continue to be a crucial partner for the United States in Asia if it creates democratic institutions of governance and reconciles competing political factions. At least for now though, that remains a big if. What's Next for US-Thailand Military Ties? The two allies meet to discuss advances in their security relationship.